Join us on a week long exploration of three countries: Finland, Sweden and Norway. Each country has its own special features. We offer unique photography locations which are not easily accessible to the independent traveller. Our base is in Kilpisjärvi, 473m above sea level, where three countries meet. From here we will make daily excursions by minibus and snowmobile sleigh. We will spend approximately 1-2 days in each country depending on the weather. 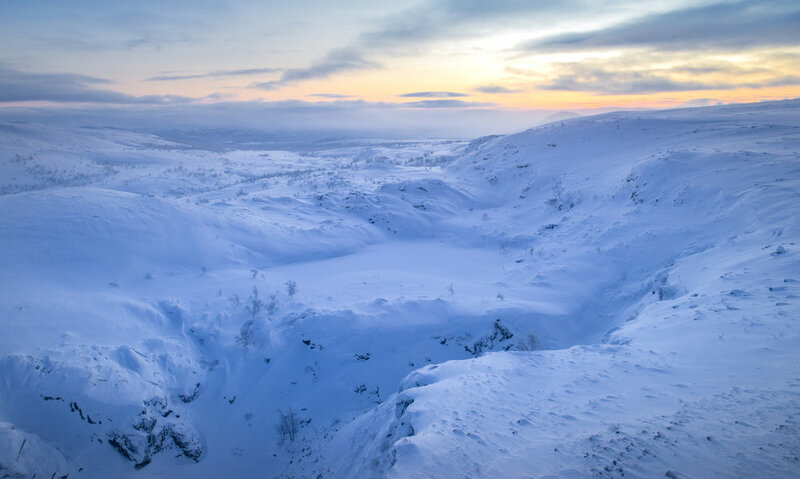 Kilpisjärvi is also in the heart of reindeer husbandry area. 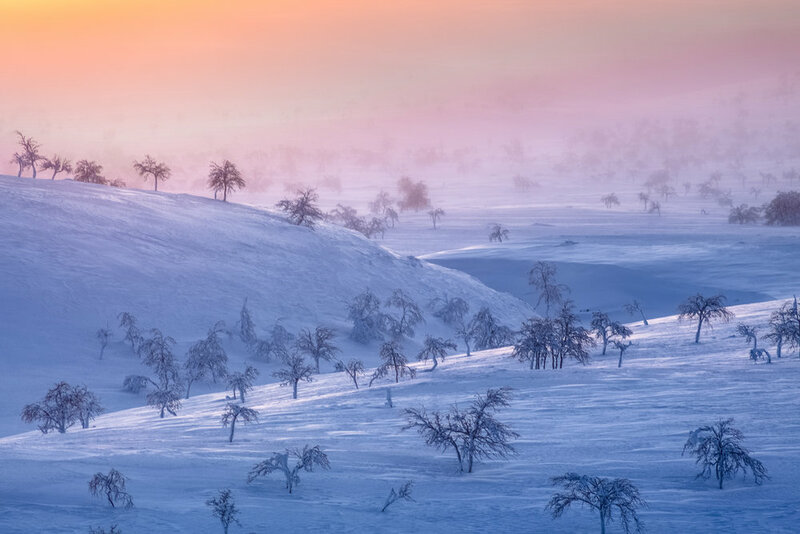 Finland offers one of the most exciting areas to photograph, the arctic desert. White treeless dunes as far as you can see on the horizon. The only sign of civilisation is the small village of Kilpisjärvi in the distance. 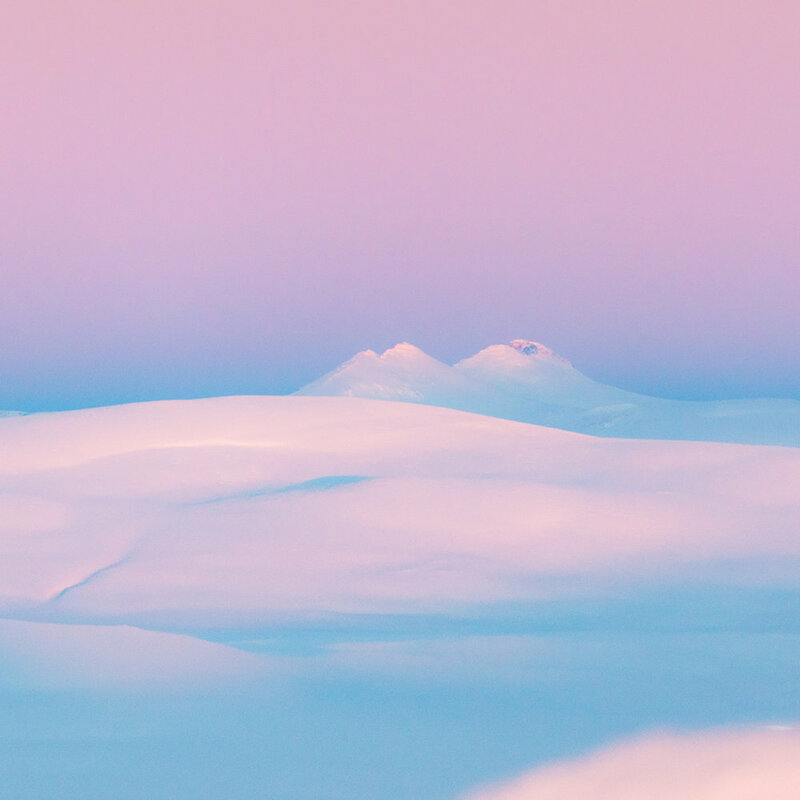 The feeling of being completely alone in the vast white desert. Only few species thrive at these altitudes. Sweden is easily accessible by snowmobile sleigh ride. A 20 minute ride brings us to the edge of the treeline. The mountain birch, Betula tortuosa is the only tree that grows at these altitudes. The landscape offers great tree portraits, snowless rocky peaks and views towards the Norwegian mountains in the north as well as the ancient Finnish fjells in the south. The vast range of photographic opportunities makes it easy to spend a couple of full days and nights in a relatively small area. Norway provides the biggest contrast to Kilpisjärvi. After a 60km drive, we reach the arctic ocean and the climate changes from tundra to coastal. This is the land of frozen waterfalls and young sharp-peaked mountains. 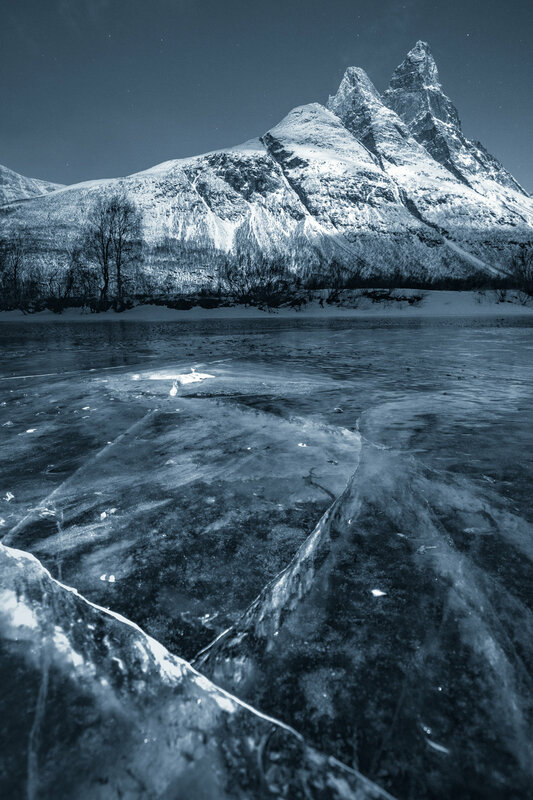 Open seas, high mountains and fast changing light give Norway's scenery its drama. 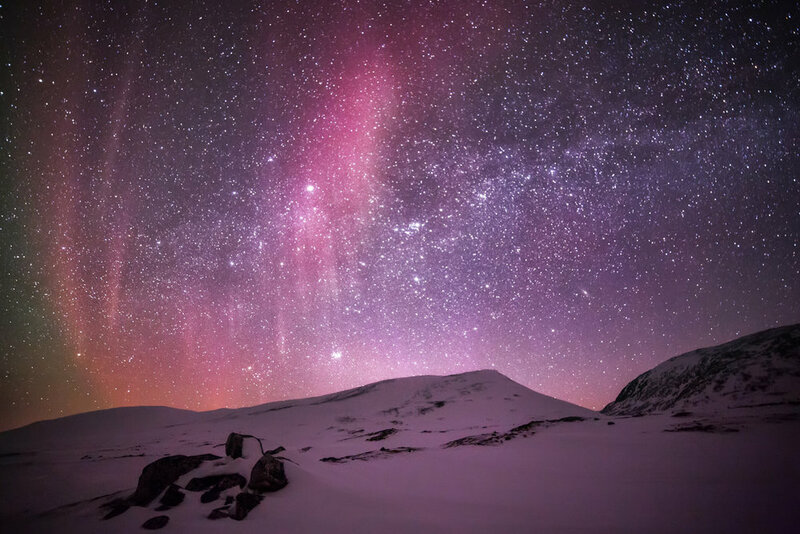 Kilpisjärvi is also known for providing some of the best opportunities for witnessing the northern lights, given its position directly within the auroral zone. Statistically there is enough activity to produce visible auroras every second day, but of course this depends on the weather. Here the coastal weather meets the inland tundra weather giving two different climate zones to choose from. 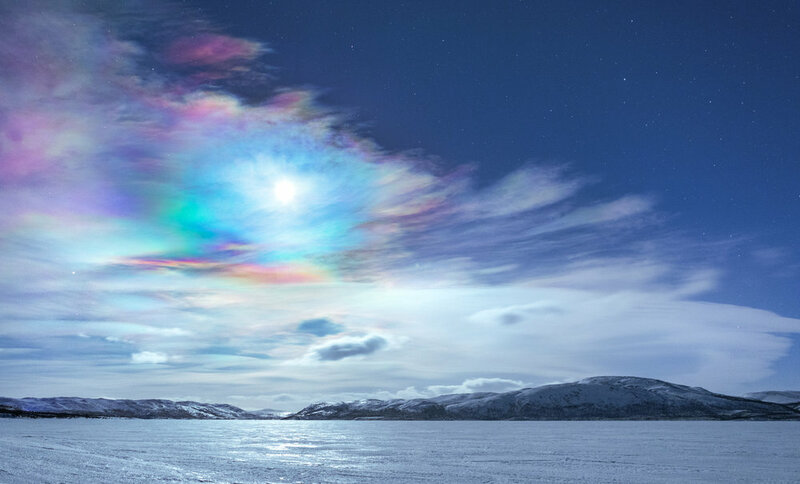 Kilpisjärvi in the middle also has its very own miniature climate which often creates a small opening in the clouds just above the village. Transfer to Kilpisjärvi, check-in, welcome info and dinner. The northern lights watch begins after dinner. 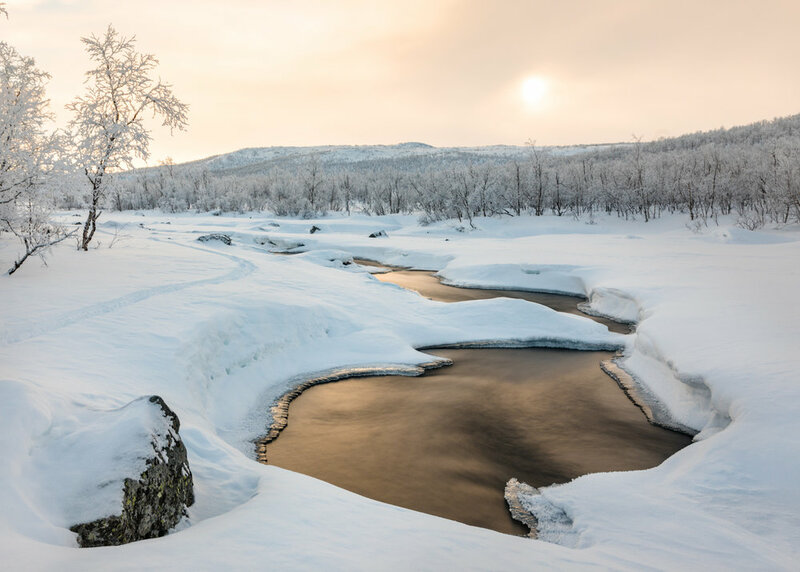 Your accommodation will be next to Lake Kilpisjärvi which opens out towards the northern skies and Saana fjell. As with most photography workshops, there is no fixed itinerary. Our locations span across three countries and three climates. 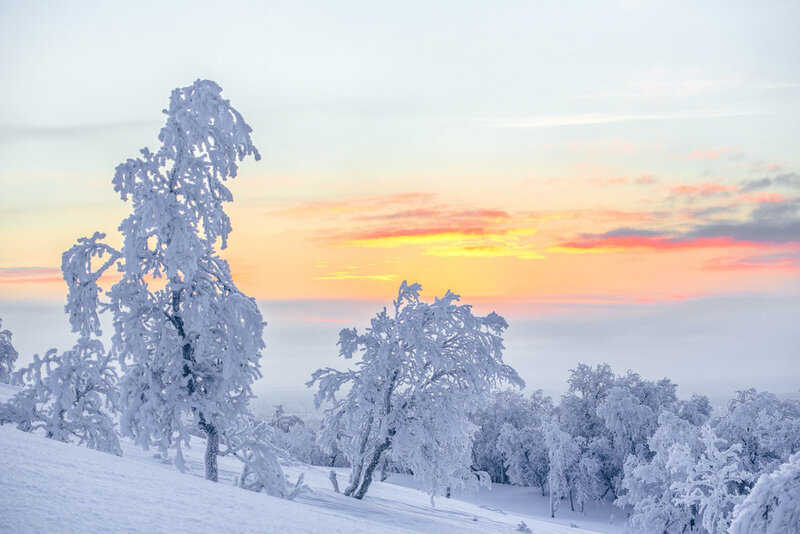 Most of our sites are a 1-hour drive or 30-minute snowmobile sleigh ride away. Daily plans are usually made the night before. This way we can make the most of the photography conditions on each particular day. We start each day with breakfast and then head out. During February days are getting a bit longer. The sun is visible between 9:45-16:00. Twilight lasts 1,5 hours before and after sunset. After a days photography, there will be time to relax and have an early dinner. After 19:00 we will head back out as the sky will be is dark enough for night photography. 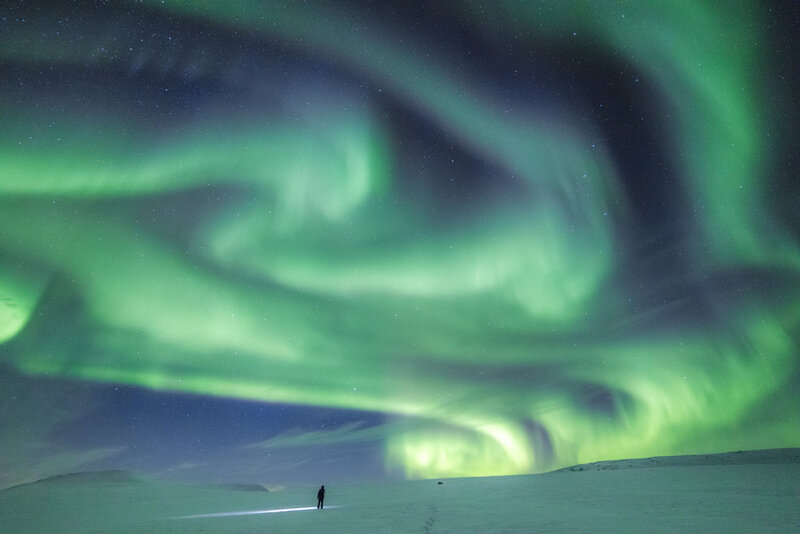 The Northern lights usually become visible around 21:00, but during solar storms, auroral displays can start as early as 17:00 and last throughout the night. 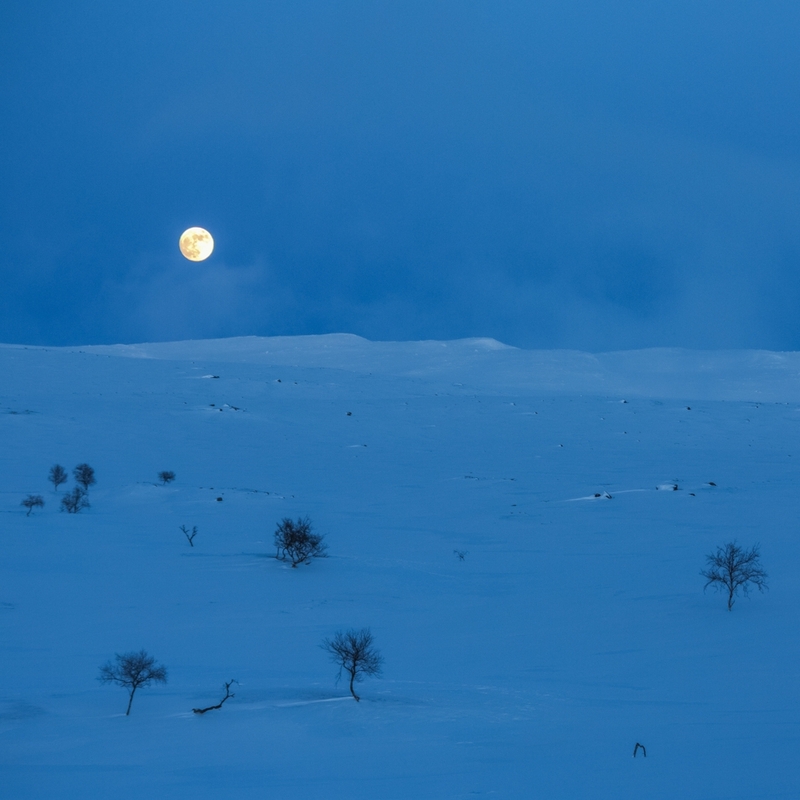 Kilpisjärvi’s surroundings offer a network of wanderer huts to seek shelter in during cold nights. Waiting for the northern lights is much easier when enjoying a hot drink the warmth of a remote log cabin in the snowy wilderness. In case of cloudy weather, we can quickly go and see what's happening in the adjacent climate zones within a 45-minute drive. 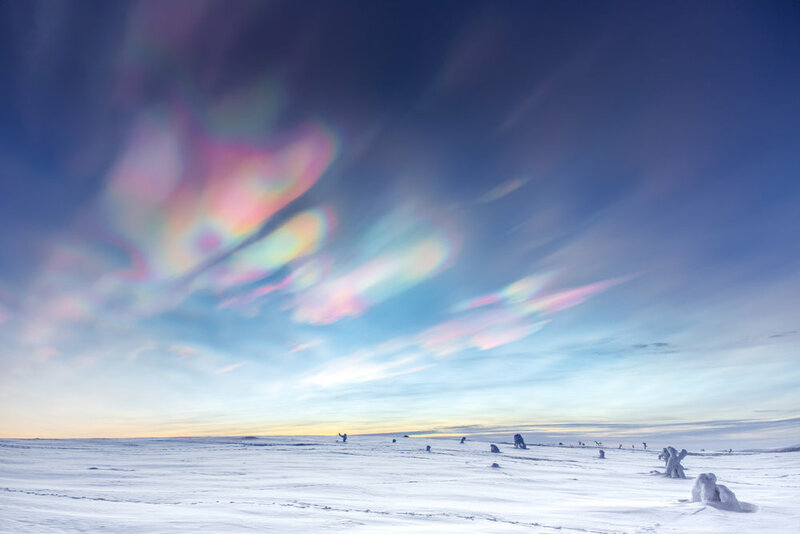 If there is full cloud coverage, we'll spend the evening reviewing images and giving instructions and tutorials on post-processing as well as how to plan your photography locations by looking at the weather, and auroral activity. One day we will spend time with a local reindeer herder in the wilderness. We will have the opportunity to photograph reindeers in their natural environment. Breakfast, check-out from Kilpisjärvi & transfer to Tromsø. The last night will be spent in Tromsø, a 2,5 hour drive from Kilpisjärvi. If we’re lucky with the weather we can make the most of the Norwegian landscape by taking two ferries and driving through the beautiful valley of the Lyngen alps. Otherwise we will head straight to Tromsø and enjoy the last day in the city. External backup drives and memory cards for storage. CLOTHING , thermal clothing is essential for this photographic trip. Down jacket, we recommend long parka style jacket. Once you lean down your lower back will be covered. Thermal gloves. We recommend mittens rather than gloves for example a Hestra Kebnekaise Mountain Mitt mittens combined with inner silk gloves. Water resistant thermal boots. It is very important that they are not too tight, boots that are a little loose will be warmer than tight boots. We recommend boots made for cold conditions such as Muck boots Arctic pro or Kamik Goliath 1. If you need any assistance with the clothing, don’t hesitate to contact us. Kilpisjärvi to buy gloves, mittens, hats, jackets etc. Our excursions are not physically demanding. Most of the locations are 100 % accessible by minibus or snowmobile sleigh ride. Few of the locations require a little 10min hike for the view but because of the highland-style landscape we don’t have to climb higher to reach the viewpoint. However you might catch your breath due to cold climate of the arctic. In spring temperatures vary from -5 to -25 degrees celsius.